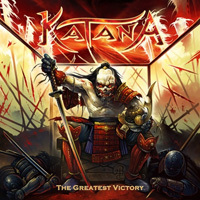 When the promotional invitation appeared in my inbox for Katana's new album The Greatest Victory, my first reaction was, "I wondered what happened to this band?" The Swedish band's previous album was a solid offering of classic heavy metal, but that was from three years. Well, the band is back with more, along with a few more songs with a Japanese feudal warrior theme. But, with my first spin, my first question was, "Did they get a new vocalist?" He doesn't sound the same. But no, it's still Johan Bernspang. To my ears, he just doesn't sound to clear. It's more likely the Swedish Bernspang singing in non-native English. Nevertheless, musically, The Greatest Victory finds Katana in fine form. Their metal is pretty straightforward: twin guitar harmony and leads over an often galloping rhythm section. The vocals are clean and harmonious as well, and they throw in more than a few gang vocal choruses. That's as old school as it gets. All this is topped of by an abundance of twin lead guitar solos. It's 1983 all over again. But it's not all a horse race of galloping power metal. Both Mark of the Beast and In the Shadows have lighter parts, notably voice over guitar at the start. The latter song, however, develops it to a greater. Yet, both eventually burst into pure classic power metal. Fundamentally, while hardly novel or genre bending, Katana's The Greatest Victory is spot-on traditional "keep it true" heavy metal. Recommended. Fundamentally, while hardly novel or genre bending, Katana's The Greatest Victory is spot-on traditional "keep it true" heavy metal. Recommended.